$30 by signing up online. 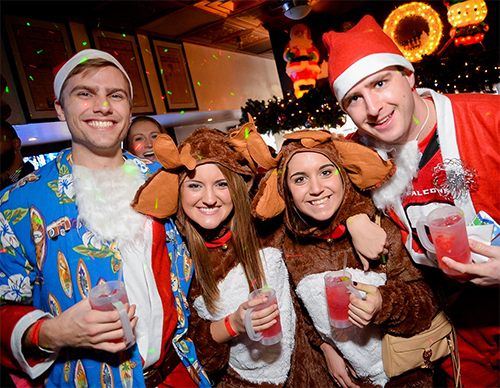 The BaltimoreSanta Crawl is a winter/holiday season themed bar crawl based in Fells Point. Over a thousand participants will quench their thirst on exclusive drink deals as they explore Fells and celebrate the holiday season one bar at a time. What you get: A refillable signature Santa mug, access to some of Baltimore's best bars, exclusive drinks & food specials and a raffle entry to win great prizes. Participating Bars: Fells Point Tavern, Admiral's Cup, The Point, Alexander's Tavern, Todd Conner's, The Abbey, Dogwatch Tavern, Rodos Bar, and more bars to be announced! 2) I voluntarily, knowingly and freely assume all risks associated with attending The Baltimore Santa Crawl on December 17th and entering the premises, including, but not limited to, my own actions or inactions, injuries, illness and contact with others.